Also known as Trimethoprim Sulfamethoxazole, or Trisul, Bactrim a human antibiotic often used for animals as well. Bactrim is not FDA-approved for veterinary use; but it is commonly accepted practice for veterinarians to prescribe this medication for dogs and cats who generally respond well to it. Bactrim is especially effective for urinary tract infections. Bactrin is also used to treat respiratory, skin, or gastrointestinal infections, and other conditions. Animals with bacterial infections are generally good candidates for Bactrim. It inhibits growth and kills off harmful microorganisms in dogs and cats. The usual initial dose of Bactrim for dogs and cats is 13mg/pound every 24 hours, which may be divided into two doses given 12 hours apart. Allow plenty of water for your pet to drink. What is Trisul used for? Trisul tablets 480mg are a combination antibiotic used to treat a variety of infections caused by susceptible bacteria in various parts of the body, when a single antibiotic has not eliminated the infection. These include infections of the urinary tract, such as cystitis, upper and lower respiratory tract, such as bronchits, genital tract infections such as gonorrhoea, and infections of the gastrointestinal system, such as gastroenteritis due to E.coli and shigellosis. It is also used for the treatment and prevention of Pneumocystis, which is a form of pneumonia caused by a type of fungus that lives in the lungs. Trisul tablets 480mg contain cotrimoxazole, a combination of two antibiotics trimethoprim and sulfamethoxazole that block two consecutive steps in the biosynthetic pathway needed for bacterial DNA and protein synthesis. Sulfamethoxazole in Trisul tablets 480mg competes with para-aminobenzoic acid (PABA) which the bacterial cells use to make an important metabolite dihydrofolic acid. Trimethoprim in Trisul tablets 480mg inhibits a specific bacterial enzyme called dihydrofolate reductase (DHFR) that converts dihydrofolic acid to tetrahydrofolic acid. These combined actions of trimethoprim and sulfamethoxazole block bacterial folate biosynthesis, needed for making nucleic acids and proteins, preventing replication of the bacteria by bacteriostasis, which limits the growth of the bacteria and stops the spread of infection. Trisul tablets 480mg are effective against a wide range of bacteria, including Staphylococcus species, Enterobacter species Escherichia coli Klebsiella pneumoniae and Proteus mirabilis. 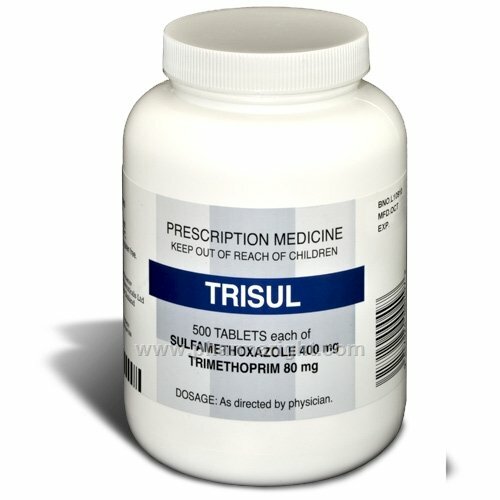 Trisul tablets 480mg contains the active ingredient cotrimoxazole, which is a combination of two antibiotics; trimethoprim (80mg) and sulfamethoxazole (400mg) that are used in combination to treat a range of bacterial infections. They also contain docusate sodium, magnesium stearate, povidone and sodium starch glycollate. Trisul tablets 480mg contain cotrimoxazole, a combination of two antibiotics that are use to treat a variety of infections caused by susceptible bacteria in various parts of the body, when a single antibiotic has not eliminated the infection. These include infections of the urinary tract, such as cystitis, upper and lower respiratory tract, such as bronchits, genital tract infections such as gonorrhoea, and infections of the gastrointestinal system, such as gastroenteritis due to E.coli and shigellosis. It is also used for the treatment and prevention of Pneumocystis, which is a form of pneumonia caused by a type of fungus that lives in the lungs. Trimethoprim and sulfamethoxazole in Trisul tablets 480mg block two consecutive steps in the biosynthetic pathway needed for bacterial DNA and protein synthesis. Sulfamethoxazole Trisul tablets 480mg competes with para-aminobenzoic acid (PABA) which the bacterial cells use to make an important metabolite dihydrofolic acid. Trimethoprim in Trisul tablets 480mg inhibits a specific bacterial enzyme called dihydrofolate reductase (DHFR) that converts dihydrofolic acid to tetrahydrofolic acid. These combined actions of trimethoprim and sulfamethoxazole block bacterial folate biosynthesis, needed for making nucleic acids and proteins, which prevents replication of the bacteria by bacteriostasis, which limits the growth of the bacteria and stops the spread of infection. What are the side effects of Trisul? The most commonly reported side effects when taking Trisul tablets 480mg include: headache, nausea, vomiting, diarrhoea sore mouth, skin rash, itching. When should Trisul not be used? What medications interact with Trisul? How should Trisul be taken? You should take your Trisul tablets 480mg with food, to reduce risk of upset stomach. The dose you day and how often depends on what you are being treated for. You should continue to take your Trisul tablets 480mg for as long as recommended by your doctor, which may be for a few days, but at least 5 days for most infections or for longer if necessary for the infection to clear. How long should you take Trisul? You should continue to take your Trisul tablets 480mg for as long as recommended by your doctor, which may be for a few days, but at least 5 days for most infections or for longer if necessary for the infection to clear. If you miss a dose of Trisul tablets 480mg take it as soon as you remember, unless it is time to take the next dose, then skip the missed dose. Do not take a double dose. How should Trisul be stored? You should store your Trisul below 25°C in a cool dry place and protect from light.